North Bay Bay sports hall-of-famer Darren Turcotte is the 2013 Judge Harry J. Reynolds Memorial Trophy winner for dedication to hockey, chair Bill Jacko announced Thursday. The former NHLer, now a successful men's and women's hockey coach, will be honoured during the North Bay Sports Hall of Fame induction and awards dinner May 3 at the Lakeshore Best Western. Born in Boston, Mass., Turcotte moved back to Northern Ontario with his family and played minor hockey in North Bay before being drafted by the OHL's North Bay Centennials, this after helping the North Bay Pinehill Coffee Shop midgets, coach by his dad Don “Butch” Turcotte, win a Air Canada Cup national championship. From there, Turcotte went on to play four seasons with the Centennials, scoring 30 goals each time, and helped the club advance to the 1987 OHL championship series, which North Bay lost in seven games to the Oshawa Generals. Selected in the sixth round by the New York Rangers in the 1986 professional draft, Turcotte went on to play parts of 12 seasons in the NHL with New York, Hartford, Winnipeg, San Jose, St. Louis and Nashville. He cracked the 30-goal barrier twice in New York, scored 20 goals three more times and finished an injury-shortened career in 2000 with 195 goals and 216 assists in 635 NHL games while representing the United States twice in the world junior championship and once at the senior world championship level. It was in Tennessee, though, that Turcotte began his coaching career, first as a tyke house league coach on his son Devan's team and then at the elite midget-AAA level in Nashville. Upon returning to Canada, Turcotte joined the NOJHL's Abitibi Eskimos as an assistant under head coach Barry McKinlay in 2006. A few months later, he joined the North Bay Skyhawks as head coach, replacing former Pinehill Coffee Shop teammate Kevin Kerr, a soon-to-be a North Bay Sports Hall of Fame inductee. Turcotte amassed a 41-28-1 record in parts of two seasons with the Skyhawks, including a spot in the national rankings in 2007. 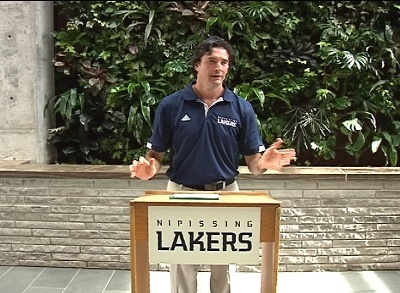 He spent a few more season in men's hockey, including time as an assistant coach with the Nipissing Lakers program, before making the switch to women's hockey. In three seasons with the North Bay Ice Boltz midget-AA team, Turcotte led the club into the southern Ontario-based Lower Lakes Female Hockey League, where they came within a win of the league championship tournament in 2012. The Ice Boltz were ousted in the LLFHL divisional round in 2013, but rebounded to win the Ontario Women's Hockey Association midget-AA championship after that to advance to the Esso Cup national championship. At nationals, the Ice Boltz finished with a 3-1-1 record in the preliminary round, beat the Edmonton Thunder in the semifinals, but lost the championship game to the Quebec representative to finish with silver. Turcotte, who also has national and provincial team coaching experience in Canada and the U.S. as well, is now the Nipissing University women's hockey team head coach and guided the program through its first season of CIS play in 2013-14. In accepting the Reynolds Memorial Award this year, Turcotte will join his dad, Butch, as a previous winner. Butch Turcotte was honoured with the Reynolds award in 1984 before the entire Pinehill Coffee Shop team was named the winner in 1985. Tickets for the induction and awards dinner are available from any executive committee member, or by calling chair Bill Jacko at 705-476-1429.